Release Date: August 17th, 2007 (IFC Center) by Picturehouse. BASIC PREMISE: A documentary about Steve Wiebe and Billy Mitchell, two men who competed for the highest Donkey Kong score in the 2007 Guinness Book of World Records. 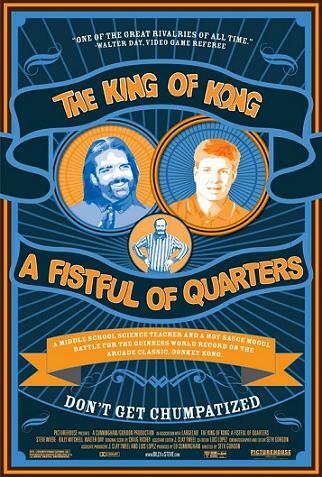 ENTERTAINMENT VALUE: The King of Kong tries too hard to be as riveting as the competition in Spellbound, but instead becomes slightly tedious and fails to keep you engaged, especially for those unfamiliar with the game of Donkey Kong. It takes a while for one of the players to even explain the rules of the game, but, when he does so, it’s too brief. The experiences of Steve Wiebe and Billy Mitchell seem rather ho-hum, such as when Billy held the Donkey Kong record for many years only to be defeated by Steve in 2004. It’s not as simple as it sounds, though. When Steve sent the tape of his winning game to the referee from Funland, the arcade location, he was scrutinized in every way for the possibility cheating. The referee even sent some men to examine his arcade machine without his explicit permission. Director Seth Gordon does a somewhat decent job of keeping a fast pace with lively and mildly fascinating footage, but not so much when it comes to humanizing Steve and Billy. Based on the footage, he makes Billy seem like he were a total arrogant jerk while Steve is a much nicer underdog. There’s more footage of Steve’s personal life than there is for Billy’s, which doesn’t make it a particularly well-balanced documentary. Moreover, Gordon fails to address the basic, crucial question: “So what?” There’s simply not enough information about the history and evolution of the arcade. It’s not quite clear why anyone should care who wins the Guinness Book of World Records for Donkey Kong points or what makes this subculture important enough to warrant a feature length documentary film. INSULT TO YOUR INTELLIGENCE: Slightly tedious, uninformative and lacking insight. IN A NUTSHELL: Lively and mildly fascinating, but somewhat tedious, uninformative and lacking insight.